Rough-skinned newt (Taricha granulosa) along the edge of a pond near Moscow, ID. Animal bodies are inhabited by diverse communities of microorganisms that we collectively call the microbiome. These communities consist of bacteria, fungi, and viruses, all of which can affect the physiology, behavior, and even the evolution of their animal hosts. 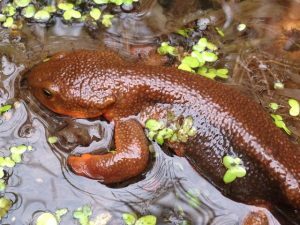 In our research, we seek to understand what roles the skin microbiome of amphibians, specifically newts and salamanders, play in the production of specialized toxins that protect the animal host from predators. We set out to address this question through a BEACON-supported collaboration between the Eisthen lab at Michigan State University and the Foster lab at the University of Idaho. 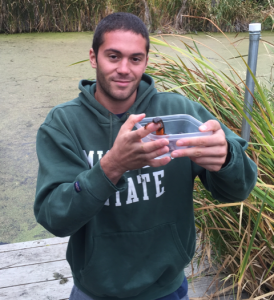 The Eisthen lab has been working on the sensory biology and behavior of a poisonous salamander called the rough-skinned newt (Taricha granulosa) for a number of years, while the Foster lab specializes in the preparation, sequencing, and analysis of bacterial DNA. Details of the project can be found in an earlier BEACON blog post. In September of 2016, I boarded a plane from Detroit to Moscow, ID, where I began a five week “mini-sabbatical” at the University of Idaho. As part of this trip, I would learn how to extract and prepare bacterial DNA for high-throughput sequencing. This was the easy part – the more challenging endeavor was to begin developing the computational and statistical skills necessary for reconstructing and interpreting the newt microbiome from the short pieces of DNA sequence generated by high-throughput sequencing. Last but not least, there were also wild populations of rough-skinned newts near Moscow! How lucky could we be? When I arrived at the Pullman-Moscow regional airport I was greeted by our friend and collaborator Dr. Janet Williams. She brought me to my new home for the next five weeks: an apartment that I shared with a fellow graduate student from U Idaho. Within two days of arriving in Moscow, I was catching wild newts near a forested park north of town and collecting bacterial samples from every newt I could find. We collected bacterial samples using sterile swabs, from which we later extracted bacterial DNA for sequencing. We also collected small skin biopsies from each animal that would later allow us to measure the amount of toxin in the skin of each newt. 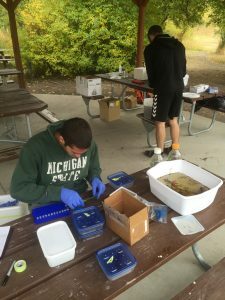 Patric Vaelli and BEACONite Yannik Roell (now at Aarhus University in Denmark) collect bacterial samples from wild newts near Moscow, ID. Bacterial samples will be used for DNA-based analysis of the amphibian skin microbiome. Samples are also collected from the pond and soil for comparison. For the next 3 weeks, I spent each day carefully extracting bacterial DNA from each swab. This process is extremely sensitive to contamination; bacteria are everywhere, even in many commercially available DNA extraction kits (a problem now referred to as the “Kitome”). Once I had extracted the bacterial DNA, I performed targeted sequencing of the 16S rRNA gene, a “phylogenetic marker” gene present in all bacteria. The sequence of this gene can be used by biologists to identify the species of bacteria within a sample, similar to a species “barcode”. Once we obtained the sequence data, I used a combination of data processing pipelines including dbcAmplicons and mothur to assemble the raw sequence data into the “barcode” sequences that I could then classify into different bacterial groups. From here, we could ask broader ecological questions about the skin microbiome. What’s the total diversity (alpha diversity) of the microbiome within each animal? How different is the composition or structure of the microbiome across different groups of animals (Beta diversity)? Do these measures correlate with traits in the animal host such as toxicity? As a BEACON graduate student, I’m extremely grateful for the opportunity to conduct interdisciplinary research at a partner BEACON school. Through this BEACON-supported “mini-sabbatical”, I was able to conduct field work with my model animal in its natural habitat, gain lab experience in preparing bacterial samples for sequencing, and begin to develop computational skills in sequence processing and data analysis. This training is invaluable for my success in future projects. I also had the opportunity to meet and work with a new lab group and live in a new place. I strongly encourage new graduate students to seek out and develop collaborations, especially with your fellow BEACONites! This entry was posted in BEACON Researchers at Work, Notes from the Field and tagged bacteria, BEACON Researchers at Work, bioinformatics, Field Biology, multi-university. Bookmark the permalink.